The Agricultural Stewardship Association (ASA) is a nonprofit land trust founded in 1990 by a group of visionary farmers in Washington County who realized that if they didn’t conserve productive farmland, it would be lost forever. ASA is committed to saving highly productive soils so that agriculture will have a place in our community and local economy for generations to come. 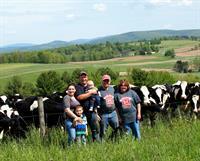 To date, ASA has protected 114 farms on 18,000 acres in Washington and Rensselaer counties. Many of these farms are dairy operations, but we’ve also conserved a growing number of vegetable, grass-fed livestock and niche farming enterprises. Come join us for our annual Landscapes for Landsake Art Exhibit held in an historic barn on Columbus Day weekend. We also offer a sumptuous Forever Farmland Supper in early August on a conserved farm.